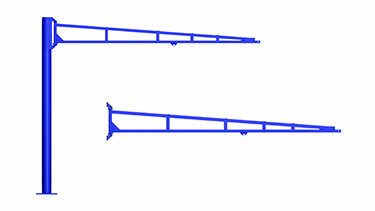 We manufacturer and distribute cranes and crane parts. 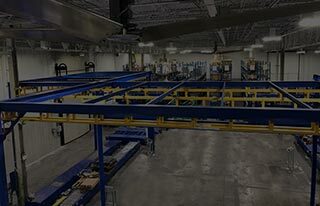 Ergonomic Partners is a manufacturer of Custom Overhead Bridge Cranes and other warehouse cranes. We distribute Gorbel Overhead Cranes, Bridge Cranes, Jib Cranes, Articulated Jibs, Gantry Cranes, Tool Balance Jibs, Festoon / Electrification, Magnetek Variable Frequency Drives, Push Button Stations, and crane parts for all industries. 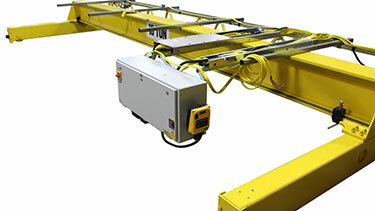 Ergonomic Partners manufacturers custom overhead bridge cranes from 250 pounds to 100 tons, and up to 150 foot spans. 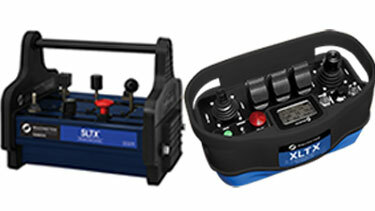 We specialize in providing the right equipment for the customers' needs. Our +50 years of experience in helping customers choose the right overhead bridge crane is proven by the hundreds of cranes sold over the past years. Gorbel overhead bridge cranes and workstation cranes offer ideal solutions for today's productivity and safety driven work places. We specialize in custom overhead material lifting, handling and manufacture custom lifting devices that integrate into most Gorbel overhead cranes. Our adjustable steel gantry cranes provide the most flexible lifting solution. The adjustable gantry can be moved to almost any location, and can be easily adjusted to provide different lifting heights. Ergonomic Partners distributes Gorbel workstation jib cranes, I-beam jib cranes, wall mount jib cranes, mobile jib cranes and articulated jib cranes for all of your lifting applications. Whether you need a small ergonomic hand push jib, or a fully motorized jib crane with a powered rotation, trolley and hoist, we have a jib that is right for your needs. Tool Balancer Jibs are designed for light loads 50 pounds or 150 pounds and include Gorbel's enclosed track and trolley like the work station jib product line. They have a small mounting footprint, 180° or 200° rotation and are lighter. The tool solutions jibs provide the most cost effective solution for applications with suspended tools such as welders, pneumatic tools and hand tools. 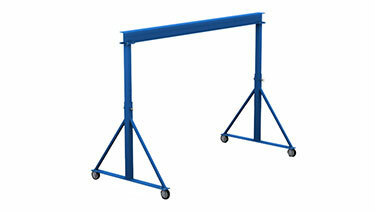 Aluminum Gantry Cranes provide the ideal way to lift materials easily. 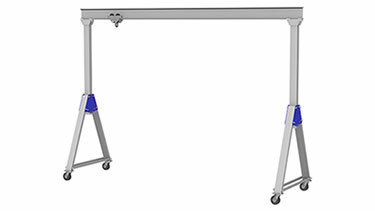 These Gantry Cranes are made of lightweight extruded aluminum and the casters enable you to move the gantry around your work area. 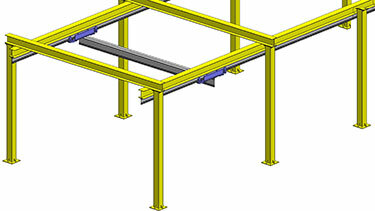 This is a more cost-effective lifting solution for areas of infrequent lifts than a more expensive permanent structure. 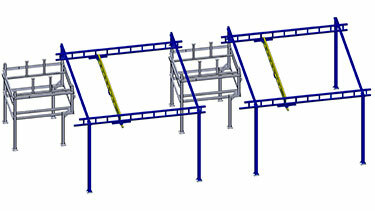 When not in use, the Gantry can be collapsed for easy storage. No matter what your radio remote control needs are, Magnetek, Laird and Remtron can meet them with our Telemotive, Flex, Patriot brand of controls. Operators benefit from increased productivity, enhanced safety and reduced maintenance costs. SBP2 and SBN pendant push button stations from Magnetek are available in 2, 4, 6, 8, 10 and 12 button configurations. These pendants are ergonomic and light weight designed for heavy duty applications. They provide optimum control and performance with less effort and fatigue than traditional pendants. Conductix-Wampfler 80 Series, 60 Series, and 20 Series pendants are ideal for overhead or monorail cranes, hoists, conveyors and other industrial machines. The 80 Series pendants can be custom configured with a wide variety of switch types, options, and accessories. 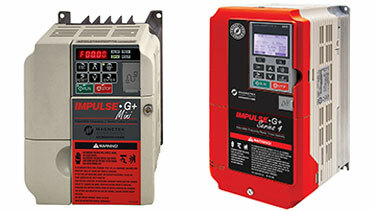 Magnetek's variable frequency drives provide unmatched performance and industry-leading safety. Designed especially for material handling applications, the IMPULSE drives are the most advanced, reliable, and cost-effective adjustable frequency crane controls available. 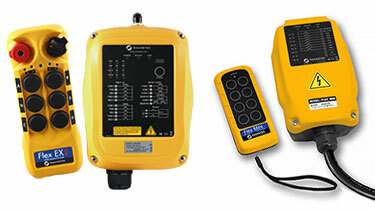 Belly Box style of wireless remote controls are designed for heavy-duty harsh and abusive environments. 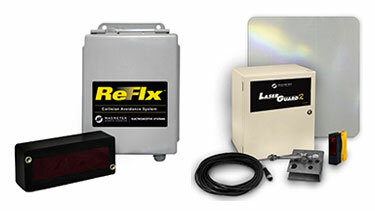 The Telemotive MLTX, SLTX, MLTX2, and XLTX systems incorporate the latest and most sophisticated wireless control technology, with flexible, durable, powerful controls built into lightweight comfortably contoured enclosures. Our crane collision avoidance systems from Magnetek and Duct-O-Wire are the ideal safety and accident prevention solution for facilities that have overhead bridge cranes. 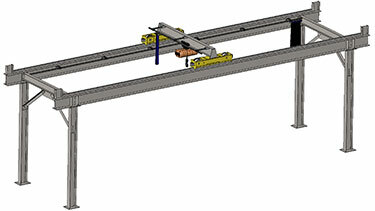 Ergonomic Partners offers a variety of systems for cranes with one bridge or multiple bridges. Ergonomic Partners offers the industries best line of crane electrification from Magnetek, Duct-O-Wire, and Conductix-Wampfler. Our sales staff can help provide your company with a festoon (flat or round cable) or conductor bar (8-bar or V-bar) system to meet your cranes power needs. 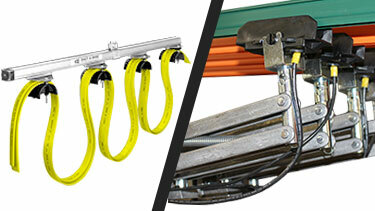 Ergonomic Partners is a complete one-stop source for crane end trucks, crane kits, and crane parts. 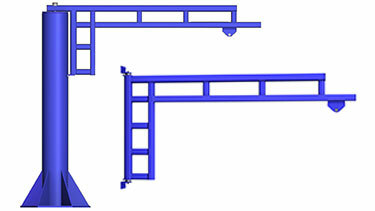 We can supply the crane kit, end trucks -or- build the entire crane to meet your applications material handling needs. TC/American is the combination of companies formerly known as American Monorail, Twin City Monorail and Spanmaster. Engineered and designed from the ground up for long wear, maximum strength, durability, and ease of installation, Patented Track cranes are ideal for curved or straight track monorail systems often found in the Laundry, Aviation, and Turbine Jet Engine industries. Ergonomic Partners provides industrial cranes for sale and serves clients from coast to coast, Canada, Mexico and especially focused in the states of Missouri, Illinois, Indiana, Kansas, Arkansas, Mississippi, Nebraska, Tennessee, Kentucky, Iowa, and Oklahoma.